Influencers can add significant value to a marketing campaign. Top-notch influencer campaigns use high-quality content to start organic conversations about a brand with its target audience. At a minimum, brands gain exposure, but many brands want more. They want to see a direct link between influencers and sales. 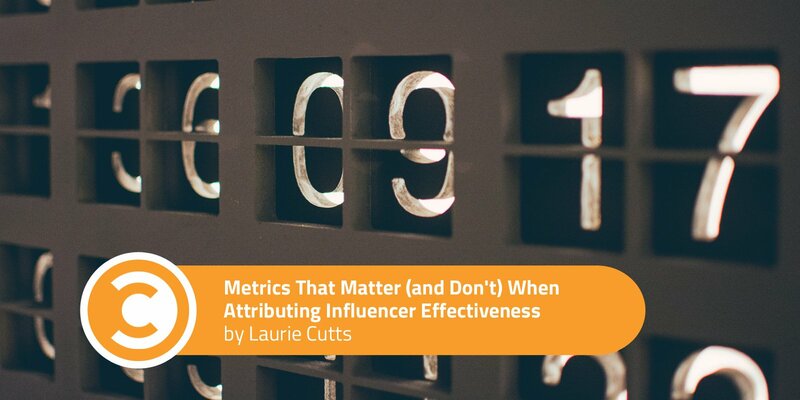 As with all marketing, metrics matter when it comes to influencer marketing. Knowing what impressions, clicks, conversions, or sales a campaign generated helps gauge performance and measure progress. Historically, influencer marketing has been difficult to track and measure, yet the pressure on marketers to be able to measure the value and impact of these campaigns has risen steadily. Currently, most brands working with influencers engage in a highly tedious, time-consuming process to track reach (followers) and engagements (comments, likes, shares, etc.). This manual approach typically involves counting the individual metrics from respective influencers and adding them to a spreadsheet. What’s more, these results often don’t include bottom of the funnel metrics, such as clicks, orders, and sales. Brands may also use UTM parameters, coupon code tracking, like-to-buy (or comment-to-buy) features, and more to track further down the funnel. However, this can also be a manual, time-consuming process. For larger brands, influencer networks are valuable partners. They can handle tracking, manage influencer relationships, create content, calculate reach and engagement, gather top of funnel metrics, and more. Many influencer networks are limited in their ability to track bottom of the funnel metrics, such as clicks, orders, sales, conversion rates, and average order value. While top of funnel metrics are valuable, CMOs and marketing professionals now want both. They want to close the loop and see the whole picture of how their influencer marketing campaigns are performing. Many key elements of influencer marketing fall under the affiliate umbrella. This means influencer performance can be measured and incentivized according to some of the same metrics used to gauge any affiliate program’s success. There’s very little difference between these two forms of marketing—both are essentially performance partnerships where compensation should align with the level of success achieved. While some brands partner with celebrity influencers with millions of followers, most partner with microinfluencers who have 10,0000 to 100,000 followers via their blog, social accounts, and other online channels. These partners tend to focus on a specific niche and have smaller, but often more loyal, audiences than celebrity influencers. To track top and bottom of funnel metrics for a microinfluencer marketing campaign efficiently, the following components need to be in place. Influencer networks have access to thousands—if not hundreds of thousands—of microinfluencers and macroinfluencers. Moreover, they regularly bring new ones onboard. Having access to large numbers of opt-in influencers allows brands to run a variety of campaigns with different microinfluencers. Opt-in influencer networks also make it easier for brands to communicate with influencers, approve work, and pay through the platform. By connecting influencers to affiliate networks or SaaS platforms, brands can track the entire customer journey, from awareness to conversion. This allows brands to collect data such as clicks, orders, and sales to help determine attribution of payments for conversions to specific influencers. Marketers’ goals may be different from one influencer campaign to the next. To gauge whether a campaign is successful or not, it’s essential to establish what success looks like. Do you want to reach more potential customers? Increase brand awareness? Get a certain number of likes, comments, or shares? Drive sales? Create great content for their brand? Setting clear goals at the start of a campaign is vital for understanding what to measure and whether or not a campaign is successful. Currently, most influencers aren’t used to getting paid on a commission basis. Content affiliates are, but not influencers—yet. What they are familiar with is getting either a flat fee payment or a free product to use and review. In a performance-driven influencer campaign, influencers are paid on a “performance plus” basis. This means they are either paid a flat fee, given a free product, or given a free product plus a flat fee, in addition to a performance fee. If the goal is to drive sales, it’s important to provide influencers with valuable discounts, giveaways, and exclusive offers that they can share with their followers. Offering something special that no one else has helps influencers guide consumers down the funnel and closer to conversion. It also gives their followers a reason to click on a tracking link and redeem a special time-sensitive offer. The key is to provide them with something special or unique to promote in their content. At Acceleration Partners, following these steps has proven to be successful for many of our clients, particularly Stella & Dot. This boutique-style jewelry and accessory brand ran an influencer marketing campaign intended to increase brand awareness and customer engagement with content generated by a select group of fashion influencers. These influencers created posts across blogs, Facebook, Instagram, and Twitter, sharing unique Stella & Dot styles. By managing influencers through an affiliate program, Stella & Dot had the opportunity to track the results, reward the influencers based on performance, and ensure that their promotional efforts were aligned with the brand. Using affiliate networks to manage influencers provides exponential benefits. To illustrate: Recently, we ran several influencer programs on behalf of seven of our clients. The campaigns lasted between 10 and 12 weeks and utilized up to 20 “engaged” influencers at the start of the campaign. We also targeted content-focused microinfluencers to help our affiliate clients reach and engage new, targeted audiences. In addition to the brand awareness and engagement generated by the campaign, our clients also now own this high-value content produced by the influencers. Brands can reuse this content, with credit to the influencer, to save time and money in content creation. Some of our clients transitioned participating influencers to in-house ambassadors following the campaign. At a time when the largest brands in the world are demanding more transparency and measurable return from their marketing programs, influencer marketing is at a disadvantage. Most brands lack a standardized, performance-based pricing structure to incentivize and compensate influencers. As a result, many end up overpaying people who aren’t getting the desired results—but not for long. By aligning the content creation capacity, authority, and leverage of microinfluencers with the scalability and outcome orientation of affiliate marketing, brands can finally acquire the metrics they need to improve the performance of their influencer marketing campaigns.